Thursday, April 7, 2016. 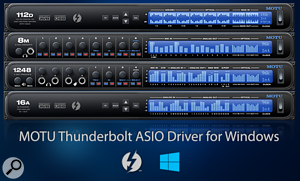 MOTU announced a new Windows ASIO driver for its latest-generation audio interfaces, including the 1248, 16A, 8M and 112D. Rewritten from the ground up for today's ultrafast PCs and modern Windows architecture, the new high-performance driver includes support for Thunderbolt audio I/O on Windows and best-in-class round trip latency (RTL) for both Thunderbolt and USB Windows operation. MOTU users can now connect their Thunderbolt-equipped MOTU audio interface (1248, 16A, 8M or 112D) directly to the Thunderbolt port on a PC laptop or desktop computer and enjoy up to 128 channels of simultaneous audio input and output with any ASIO-compatible host software. 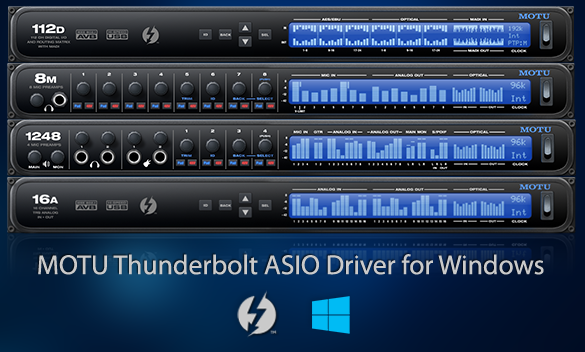 The new MOTU Thunderbolt/USB ASIO driver supports all latest-generation MOTU audio interfaces (equipped with AVB/TSN networking) and will be made available to all MOTU users as a free download during Q2, 2016 at www.motu.com/download. "MOTU is thrilled to deliver Thunderbolt support for our many Windows users," said Jim Cooper, MOTU Director of Marketing. "Whether they use Thunderbolt or USB to connect to their computer, MOTU Windows users will enjoy the best possible latency performance on the market."